BE B296HX Pressure washer, 2900 PSI, 2.3 GPM. 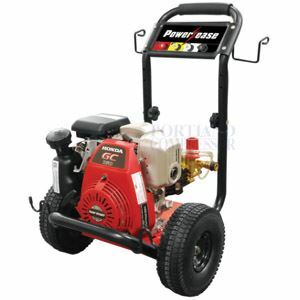 The P296HX pressure washer is an entry level gas washer that features a reliable 6 Horse Power Honda engine, to go along with a high quality and durable washer pump. The washer comes complete with everything you need to start cleaning, including a hose, 36" lance, gun, and tips. This is a common pressure washer for homeowners, property and small business owners, and handymen. Complete With Gun, Hose, and Tips!